Happy Thanksgiving! At this time of year, we pass along our special thanks to you, for your friendship, your support and your prayers. We have wonderful news. Our village translators have been approved! Please turn to page two for more information. Thank you once again for your helping hand, which keeps our mission strong and well. Thank you! 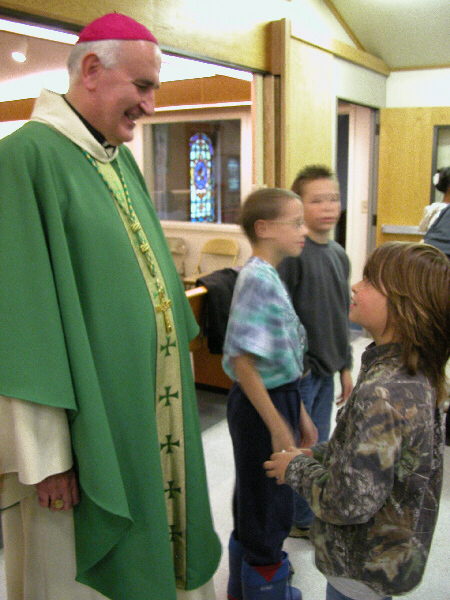 HEALING (left): In Nome October 10th, Bishop Donald Kettler chats with a young parishioner after celebrating a Mass of reconciliation broadcast throughout western Alaska over KNOM. Kettler, who was ordained bishop in August 2002, appealed to anyone who may have been abused in any way by a representative of the Church to come forward to seek healing. GABRIEL AWARD: At press time, program director Ric Schmidt is preparing to accept KNOM’s twelfth Gabriel Radio Station of the Year Award. We’ll have a photo next month. Please stay tuned! KNOM is the oldest Catholic radio station in the United States, on the air to inspire, uplift, educate and encourage village Alaskans throughout 100,000 square miles. It is a vast region that has endured cultural upheaval since its assault by Western civilization just over a hundred years ago. Our signal carries the Mass and Rosary into incredibly remote points, as well as inspiration, education, information, companionship and positive entertainment. Our mission is funded entirely by the kindness of good people like you. Thank you for making our important work possible in this road-less most far-flung corner of the United States. INSPIRATIONAL SPOT: It’s cold! Winter is quickly sweeping upon us. Most of us are not looking forward to it. However, after a busy summer, winter can offer some quiet time to spend with God. Say. Winter might not be so bad, after all. ON THE LOOKOUT (left): Florence Busch prepares KNOM’s display at the Marquette University volunteer career fair this autumn. About half of KNOM’s volunteers learn of the station at gatherings like this, and about half contact us through the Catholic Network of Volunteer Services and the St. Vincent Pallotti Center. We accept 5 volunteers each year from among about 30 applicants. We encourage potential volunteers to check www.knom.org/volunteer/vol.htm. WE CAN TRANSLATE THAT! (left) We are excited! Hurray! The Federal Communications Commission has approved the construction of eleven 10-Watt translators for KNOM! We’re planning to install them in the widespread villages of Shishmaref, St. Marys, Kaltag, Nulato, Ruby, Holy Cross, Aniak, Tununak, Little Diomede, Newtok and Toksook Bay. KNOM’s audio will be sent to each village’s transmitter via an AT&T satellite circuit. We’re well past the summer construction season, but hope that we can place transmitters in at least the first three of those villages, possibly in late November. We will then install as many as we can next summer. The Commission has given us three years, and barring unforseen trouble, all should be up and working long before then. Two Yup’ik villages, Newtok and Nightmute, some 300 miles south of Nome, were accidentally dropped by the F.C.C. and will be reinstated at some future date. Each translator is expected to cost about $5,000, though transportation and shipping may increase that. The expense of satellite circuits for all thirteen should total about $90,000 a year. We may be asking for special help with that. Overall, we expect that these translators will increase KNOM’s listenership by about 50%. We offer our most sincere thanks for the many friends who offered to exert political pressure to see that these applications were approved, and we are relieved that it was not necessary. Thank you! Please consider adding missions like KNOM to your will. We prayerfully place all bequests into funds that are used for major capital improvements and to provide for emergencies. 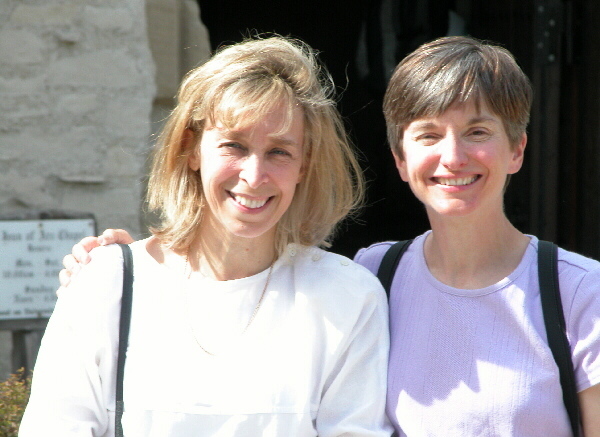 SEVEN (left): That’s how many volunteer years are represented in this photo of Mary Yanikokski Schmidt (left) and Marie Dieringer Fessenbecker. Mary served the mission from 1980 to 1984 and Marie from 1981 to 1984. The pair, both married with children, visited with Tom and Florence Busch at the St. Joan of Arc Chapel on the Marquette campus. 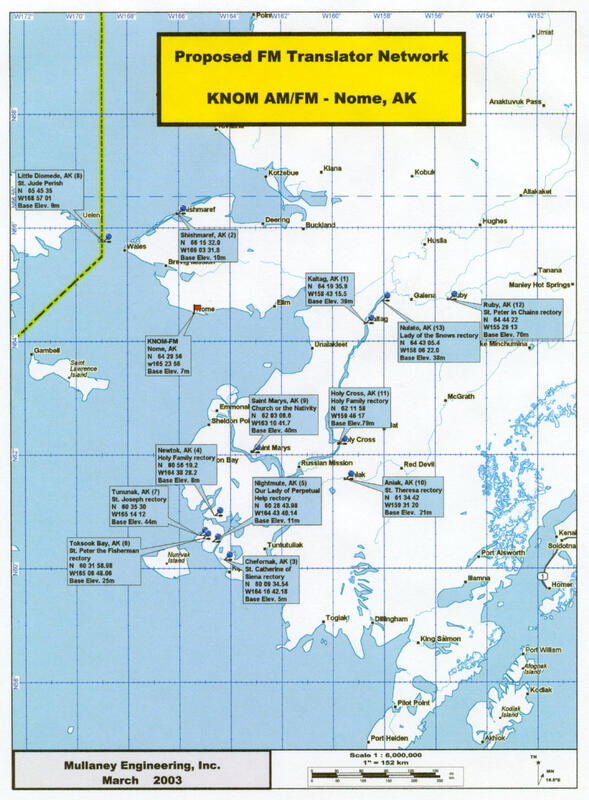 THIRTY YEARS AGO: November 11, 1974, the worst storm in fifty years slammed into Nome. Ocean water coursed over the town’s sea wall, pouring into buildings. Waves slammed completely over two-story structures, filling the street. Some sixty homes had to be abandoned, an immense number for a town of 2,000 souls. For the first time in its three-year history, KNOM broadcast around the clock, on the air for 42 continuous hours. The station became a conduit for emergency information, as well as a comfort to a city without electrical power and drinking water, under attack from the sea. Throughout the period, one ham radio operator and the two-way Associated Press teletype were the town’s only communication with the outside world. A hunt-and-peck typist, volunteer news director Steve Havilland kept families in touch with loved ones in Anchorage and the Lower 48. KNOMers breathed a sigh of relief that the station’s emergency generators and transmitter, troublesome the previous month, were up to the task during the storm. 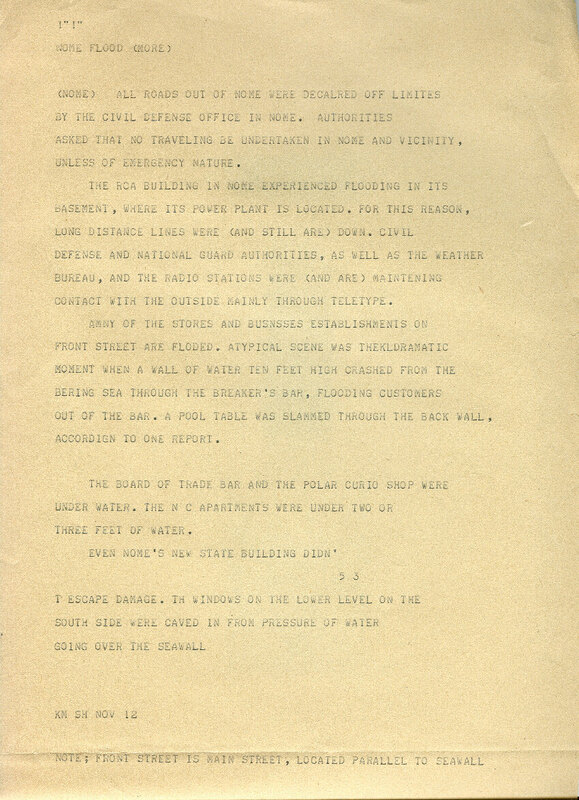 (Left) One of Steve Havilland's hand-typed news stories on the AP wire. 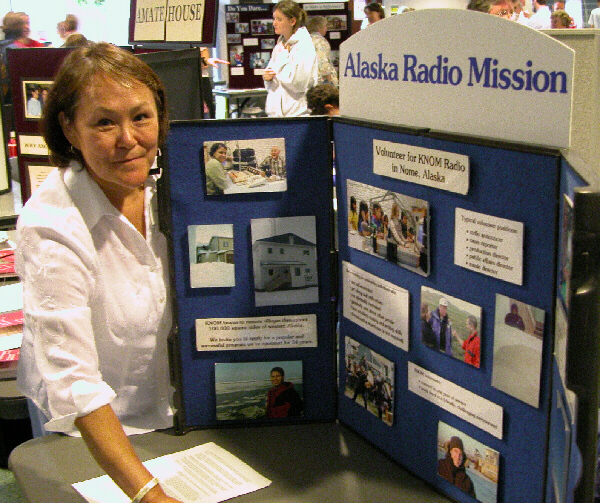 NET PROCEEDS: We continue to add photos and information to our mission’s web site, www.knom.org. We invite you to catch up on the latest news, read the history of KNOM and how it has evolved and grown, and enjoy hundreds of pictures. 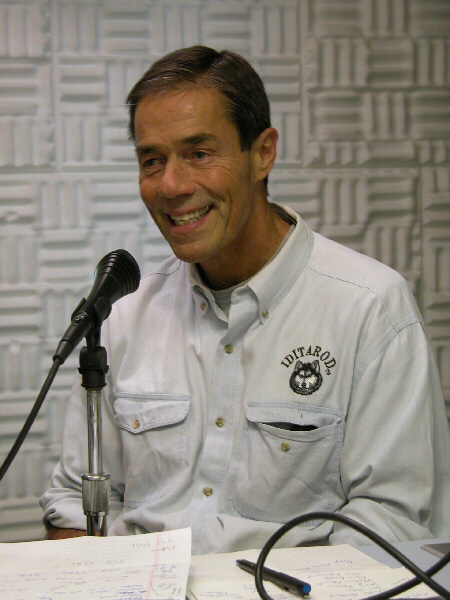 CONTESTED: (left) U.S. Senate hopeful Tony Knowles stopped by KNOM for an hour-long call-in program in October. He’s a past two-term governor of the state. This show was a rare opportunity for Western Alaskans to ask tough questions and challenge candidates on issues that concern them. With the many problems in this region - alcoholism, child sexual abuse, suicide and domestic violence among them - there is a lot to talk about. Since its inception, KNOM has offered many hours of interviews and debates before each election. That may be one reason why villages where KNOM can be heard have a far higher voter turnout than Alaska’s average. INSPIRATIONAL SPOT: How often do I think about heaven as my final goal for living here on earth? I should remember what Our Lord said: “Wherever your treasure is, that is where your heart will be. INSPIRATIONAL SPOT: God will always find you. No matter what problem you’re facing or how far you think you’ve drifted away, God will find you. Take a minute each day to acknowledge the Lord’s presence. PLAY BALL! (left) On the Bering Strait beach, children in the isolated village of Wales play “Eskimo baseball," with the island of Big Diomede, Russian soil just 27 miles away. Accompanied by Amy Flaherty, KNOM volunteer Katie Ringenback flew to Wales to learn more about this unusual version of the sport. (Left) An exuberant Katie poses on a hillside above the village on a rare sunny day. 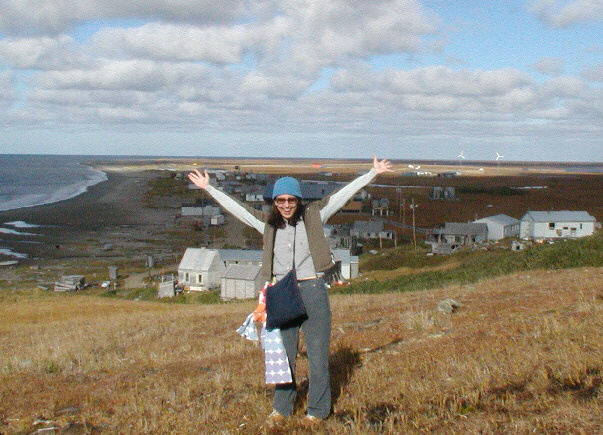 Located on the western tip of the Seward Peninsula, the extremely remote point is home for 158 people. It’s been inhabited for at least 1,500 years. REALLY COOL: By the end of November, Nome’s thermometer can dip as low as -39�, though the normal daily low temperature is a more balmy +2�. Daytime highs will be in the teens. As you can imagine, we are grateful for a well heated radio station! As another Alaskan winter closes in, we again thank you sincerely for your generous help and especially for your prayers for our work. We pray for you at our weekly staff meetings, and in our individual prayers as well. May God richly bless you for your kindness.